There's no doubt that this year's Surface Pro models are significantly faster than the last generation since Kaby Lake-R doubles the number of cores from Kaby Lake. The bigger question, however, is how much or little the models will throttle when under load. Performance throttling was abysmal on the 2017 series and it's just slightly improved for this latest iteration. When we tested the Surface Pro 2017 series last year, we discovered a major drawback that most other reviewers either shrugged or ignored: Throttling. Processor performance from the Core i5-7300U and Core i7-7660U SKUs would drop by as much as 18 to 31 percent over long periods. Thus, users who purchased the Core i5 or i7 SKUs expecting Core i5 or i7 performance would actually be getting much slower results than advertised. For the 2018 Surface Pro series, Microsoft has finally made the jump from 7th gen Kaby Lake to 8th gen Kaby Lake-R with the promise of improved cooling. Has the company stuck to its word? A good way of testing CPU performance sustainability is to run CineBench R15 Multi-Thread in a loop and recording the final scores for each round. Our graph below plots the 2018 Surface Pro i5 and i7 SKUs against the 2017 Surface Pro i5 and i7 SKUs. Performance throttling can be observed across the board with some SKUs suffering more sharply. 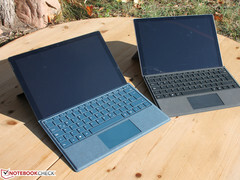 The largest drop in performance is last year's Surface Pro i5 SKU at 31 percent followed by this year's Surface Pro i5 at 25 percent. The latest Surface Pro i7 is an improvement with a performance drop of 12 percent vs. 18 percent on the 2017 equivalent. In other words, the 2018 series fares better, but only by smaller margins than we had hoped for. Even after accounting for the steep throttling, however, the new Kaby Lake-R models are still significantly faster than the last generation Kaby Lake models. Jumping from the 2017 Surface Pro i5 to the 2018 Surface Pro i5 brings a raw CPU performance boost of about 50 to 75 percent and the i7 SKUs see similar results. Microsoft's implementation of Kaby Lake-R may be slower than average when compared to "proper" Ultrabooks, but it's certainly the fastest Surface Pro series yet by far.